And blocks, items, mobs, and more. what by what is the cavenia portal? Can someone tell me the difference between Cavern and Cavern II? To me they seem like they're the same, do they have the same dimensions only with Cavern II adding the "Mirage" dimension? I've been wondering the same thing, it be nice to remove the mining rank system as well via config. I used another mod to teleport into the first cavern without using the portal, now whenever I die or use the portal, I can't get out. This also goes for the other caverns. Please fix your portal system, thanks! WARNING: this mod ruins your spawn of zombies and skeletons. It totally screwed up my world and took me forever to locate which mod it was. but it is this mod. don't use it if you like skeletons and zombies. What needs to be in a mod to support Caverns, Mineralogy replaces vanilla stone with it's own types in layers. I've played this mod before, but only in conjunction with another mod that occasionally blanked out my inventory and mod progress. I don't use that mod any more. I just made it to Aqua Miner. I had no idea it was so great! I went to the aqua cavern and I am now richer than God. Now the only thing keeping me from end game is experience and good spellbooks. When did Cavenia and the Huge Cavern get removed? I miss them both. 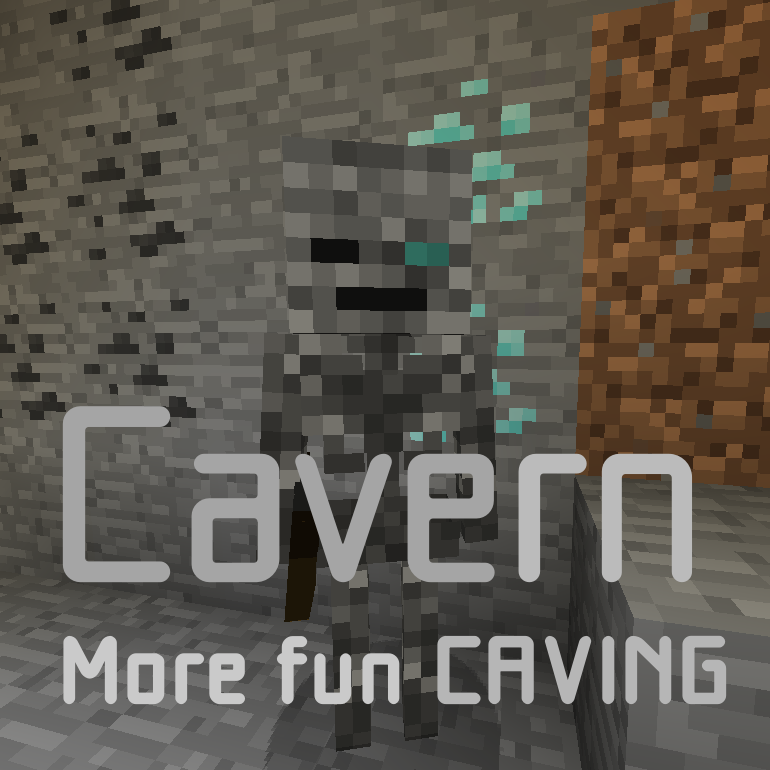 Huge Cavern was a great place to build large buildings and Cavenia was good for hunting cavenic monsters. EDIT: Also, how does the Compositing book make equipment? I just got it and nothing I try works. Your explanation on the Compositing page doesn't help much. Hey, I downloanded this and it said that it had a VIRUS. Trying to infect my computer??? If you're using Chrome, it's actually normal. It doesn't say you have a VIRUS, it'll say something like "This type of file can harm your computer? Do you want to keep said mod anyway?" after downloading and there'll be 2 options. Keep or Discard, so far for the last 3 and half years I've had no viruses from any minecraft mods. I lose all my frames when entering the cavelands. This was byfar the best one I have seen yet, but now I cannot enter it because my game freezes. I have a frame every like 30 seconds, but typing commands or leaving the game does not work. I had to delete one of my worlds already. Can anyone help? Dude, how about explaining what the weapons do and all the magic stuff. Don't add stuff to your mod if you aren't going to explain it. Where on the "Pages" tab does it explain any of the bows or magic spellbooks? Yes, I would like to know too. Trying out this mod and it's pretty cool and expansive. My question though is is there a reason my mining level isn't going up? I'm stuck at Beginner at 0%. I have no trouble improving my Magic level. you have to mine in a cavern dimension for your mining level to go up. That's what I'm doing in the Cavern dimension. I'm mining ore blocks, stone, everything and it's not going up. I thought it was my pickaxe that was the issue, but I switched to an Iron Pickaxe and still nothing happened.